I missed out on the 1970s/1980s heyday of board wargaming, but I was big into the 1990s video game translations--Panzer General II being my personal favorite. Sadly, these and other turn-based strategy games faded with the rise of the RTS. But though I appreciate the frenetic action of Starcraft and C&C, I never stopped loving this slower, more genteel breed of strategy game. As with isometric RPGs and point-and-click adventure games, iOS has stimulated a resurgence of interest in the faded genres of yesterday. In 2012, specialist studio Shenandoah Games released Battle of the Bulge, a small-scale but deep wargame set on a classic board divided into pieces (though not hexagonal, as in the classic model). The game let you play out several scenarios related to the historical battle, and even choose the general you would face (the A.I. for which would then pursue a strategy in line with their historical predilections). Games were relatively short, but never seemed to play out the same way. And it came chock full of history lessons! It was, in a word, awesome. 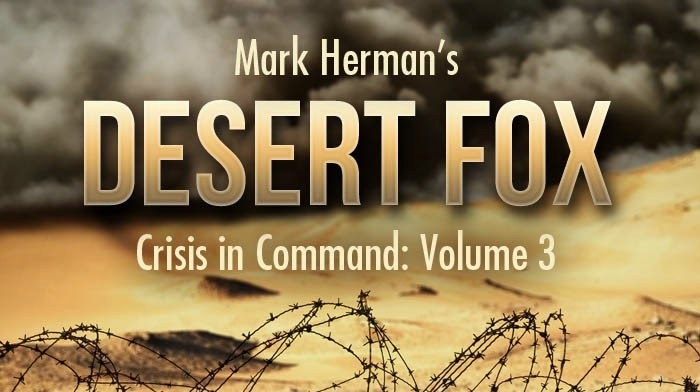 Desert Fox: The Battle of El Alamein is the third installment in the Crisis in Command series, after The Battle of the Bulge and 2013's Drive on Moscow: War in the Snow--and it may be the best one yet. 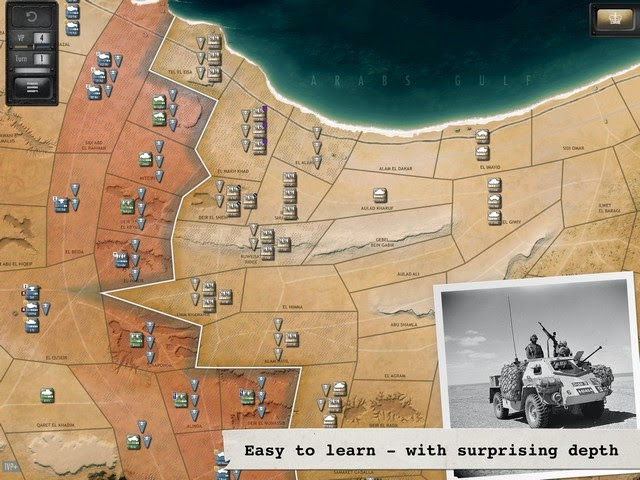 The game puts you in the midst of the Western Desert Campaign of 1942, in which Axis forces (under the command of the eponymous "Desert Fox," General Erwin Rommel) attempted to drive the Commonwealth forces out of Egypt to clear a path to Persia and its oil fields. Historically speaking, the campaign featured a whole bunch of German advances until the stalemate at the First Battle of El Alamein (July 1-27, 1942) slowed Rommel down. Then new British commander Lt. General Bernard Montgomery ended Hitler's oil dreams permanently at the Second Battle of El Alamein (October 23 - November 11, 1942). It was the first major victory for the Allies since the start of the war. Desert Fox is built on the same engine and features the same general gameplay dynamics as earlier entries in the series. 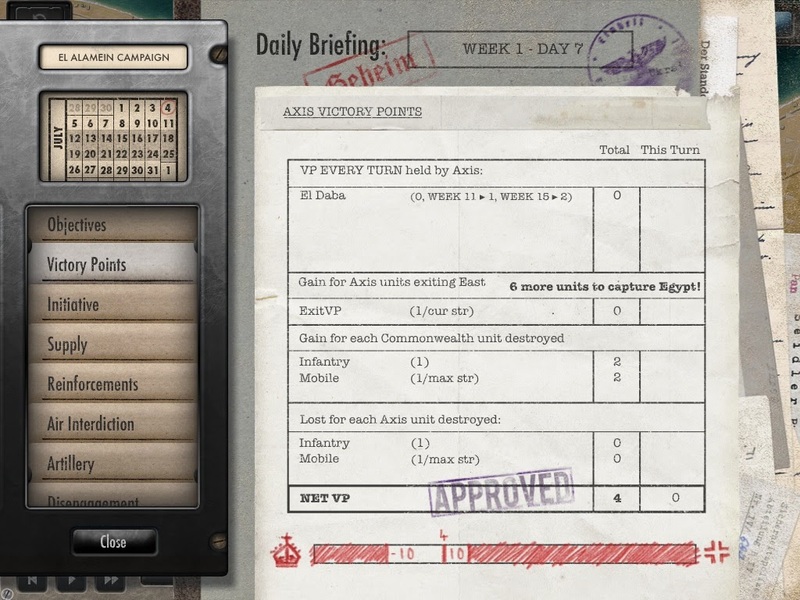 You take the role of Axis or Allied commander, and either face off against a historical opponent or a friend. Each side has a limited number of days, divided into a discrete number of turns, to achieve specific goals, most of which involve either capturing a set number of vital points on the board or getting units past the enemy defenses (while maintaining supply lines). Each player moves units on one hexagon per turn--a departure from the normal way of things in a lot of wargames (where players move all available units in each turn), but which lends the battles a gratifying chess-like feeling. There are different units--infantry, armor, APC, etc.--all with different advantages and disadvantages. And there are serious terrain effects, ranging from armor bonuses gained while defending cities to roads that facilitate breakouts. The elegance of this formula is what made The Battle of the Bulge such an inviting and addictive experience. Though the core gameplay returns in tact, Desert Fox nevertheless adds a few new wrinkles that keep things fresh. Now you have to contend with--or receive protection from--landmines and barbed wire. Even if you wipe out enemy units on a given space, you won't be able to advance until you clear the mines and wire, and only certain units (i.e. infantry or mechanized infantry) can do that. There are also significantly altered supply dynamics. In the first two entries in the series, units were supplied as long as they sat on an unbroken chain of friendly territories. But now any unit can go out of supply after taking action (or retreating after being attacked). Each side has a limited amount of supply they can airdrop in, and unsurprisingly, the Axis has less supply to go around, while also having to contend with bombing runs on supply lines. But the Axis get a more complex array of units, allowing for tactical approaches not available to the Commonwealth. There are the standard armor and infantry, plus mechanized infantry, super fast recon and flak, which can negate Commonwealth air power and help keep units in supply. Finally, Shenandoah made some neat decisions with the menu system that really top off the experience nicely. Keeping track of things is super easy, and you always have access to historical information on the events portrayed in the game. Everything is nicely presented and intuitive, and the tutorials are among the best I've ever encountered in a strategy game. My only real complaint is that it would be fun to have an additional mode where each side has to deploy its units at the start. 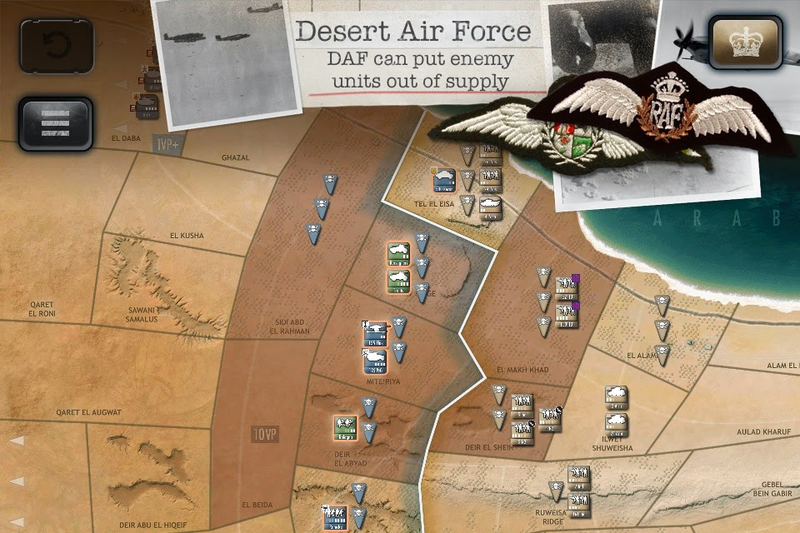 In the end, Desert Fox presents a balanced, challenging and deep strategy experience. And it manages to present something that can appeal to both hardened wargamers and genre neophytes. While I'd still recommend the latter to check out The Battle of the Bulge first, it's not necessary to enjoy Desert Fox. Bonuses: +1 for managing to make a wargame that is simultaneously deep and accessible; +1 for the supreme elegance of the game design. Penalties: -1 for where's that deploy-ever-unit-myself mode?